"All my family and friends love my cookies I make. I thought I would try something different, so I made a marbled chocolate chip cookie. They came out GREAT!!" In a large bowl, cream together the shortening, water, white sugar and brown sugar until light and fluffy. Add the eggs one at a time, beating well with each addition, then stir in the vanilla. Combine the flour and baking soda, stir into the creamed mixture. 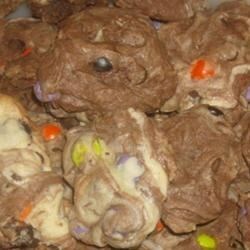 Fold in the chocolate chips, then fold in the cocoa powder last to create a marbled effect. Drop by rounded spoonfuls onto a cookie sheet. When I made these cookies instead of "marbling" in the cocoa I stirred it in completely, so it was a chocolate chocolate chip cookie. These are good cookies, but... not the cookie for my family. They don't have that sweet tollhouse cookie taste to them. While it was fun to try something different, I won't be making them again. good with 1 package chocolate, 1 package vanilla pudding! i really enjoyed the recipe. my father-in-law begged me to make them again. These remained chewy with lots of chocolate chips. I found they made more than the 5 dozen. More like 7 generous cookies. quick, easy, excellent recipe... my boyfriend went into a chocolate coma.